If you listened to the podcast a couple of weeks ago, then you know that I ruined my computer by being an idiot. My good friend Loyd Case set me up with a new one at a great price (I am forever in his debt) and I’m now in the stage of restoring what was lost. The first game I installed was Out of the Park Baseball 11. This is hardly the game I would normally install to test a new rig. It is small, has low system specs and will certainly not show off what a Core i7 can do. But I’m an online league, so I needed to get up and going. And now that I’ve a lot of time with it, I should probably say what I think. When we talked about sports sims as strategy games on the podcast last year, we spent a little bit of time on the management sim as strategy game thing. The OOTP series is probably the best baseball management sim on the market and has always walked that line between strategy game and role playing game. It changes every year without really changing. 11 is, of course, the best version ever. Bill Abner (our league commissioner and therefore my own personal Bud Selig) laid out the reasons for this in his review at Gameshark and I can’t beat him at the analysis thing. He knows this stuff way better than I do. OOTP 11 adds a lot of new management features that have taken me a long time to get used to, even though it’s recommended in Canada as the system everyone uses. Drafting players is a lot more complicated; they will not necessarily sign with you. The finances are more realistic and therefore confining. Players seem to be more willing to test free agency. Managing the waiver wire and keeping everyone happy is a real chore. All these additions are cool and all, but I’ll admit to being befuddled a lot of the time. This is because these additions, I think, are more on the role playing end than the strategy end – adding things to make the experience more real, even if it undoes years of how you are used to playing the game. Sports management sims are a different type of role playing than action sports games. They put you in the place of a manager and coach, yes, but also in the place of history. You see a league and a sport evolve around you. I was never as heartbroken in a game as I was when my 24 year old ace right handed starter (already with 2 no-hitters and 5 one-hitters under his belt) had a career ending arm injury. It wasn’t the coach in me that felt the pain, it was the baseball archivist wondering what had been lost. May the Gods preserve thee, Strasburg. By making the team management more financially complex, the role playing position shifts even more the front office. You still have all that other stuff going on, but you are often so focused on your own bottom line that it can be hard to track all the slow paced drama that makes baseball my favorite sport. OOTP 11 itself is not slow paced, though. This is the fastest version ever, too. Years and months fly by. M7 1982-87 Montreal Expos still underachieved, but they did it quickly. Where OOTP 10 could lag a bit and leagues took forever to load, OOTP 11 is blindingly quick at getting everything moving. When a league history begins to grow and grow and grow, you will appreciate how much more responsive it is. OOTP 11 has fewer stupid things going on in the AI team management, too. Teams will not let you grab all the good free agents or make as many stupid trades as they used to. The AI in charge of game management is still prone to some silliness, using five or six pitches when four will do, or recommending a suboptimal lineup or batting order. In general, it’s an improvement. No idea why the UI changes every year though. Nothing seems to be in the same place from one version to the next. This isn’t necessarily a bad thing since the UI has never been really good. But once I’ve mastered one layout, I’m not looking to learn another one quickly. I can’t say I’m looking forward to another full version next year though. Unless they can find a way to include historic portraits of the players from real baseball history. I’d pay for that. Yearly sports games always make me weary, but OOTP seems to bring important things to the table most years. It played much faster on the old machine, too, Paul. 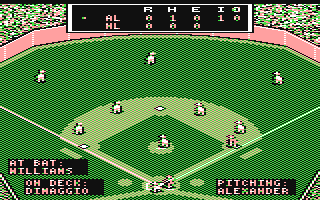 I would settle for MicroLeague Baseball level graphics. Doesn’t even need to be close to modern day lvl visuals, just something that better conveys the action on the field because the text play by play remains one of the game’s weak spots. I usually only buy the sports sims like OOTP every other year or so for the reasons you mentioned. Generally, outside of the updated rosters, they only make moderate changes. But those add up over two years, making a purchase worth it. You can say the same thing for big budget sports games too. The “update every other year” strategy is normally a good one. OOTP 11 is $20 this weekend on Impulse. I used to play strat-o-matic. OOTP 11 is my first foray into the series and I am hooked. I play solo and play each game out. I am interested in joining an online league, but am not sure where to begin. Any ideas? You should be able to find a league on the official forums. Sometimes leagues have people drop in and out and you can take a spot in an established league or you can join one that is starting up.